Update (Oct 29, 2013): With Home Sharing turned on and iTunes11, all my devices(iPad, iPhone, Netbook) are synced with my main PC (i3, Win7) with medias in an external HD! Sweet. No fuzz with Win Media Center anymore. How: with your iPad, iPhone, open Music app, and look for Share in More… click your library. For other PC, install iTunes and turns on Home Sharing. (Nov, 11,2012)So I had been using my 7 years old resurrected HP laptop as a media center with my music library residing in one of my external HDs. It had been doing a decent job, but sometimes it had been a hit and miss; for example, adding new materials, sometimes, they showed up and other they just didn’t. It took me a while to learn to play all songs with shuffle, and to do a search (it only takes up to 4 characters I remember). I used it for about a month, then I figured out it was easier to pop a CD into my DVD player to play music with my AV receiver (Those you attach with big speakers!). Anyhow, a light bulb moment today! Since I have to turn on my main laptop anyway for either streaming – Windows Media Center or iTunes – and I have my iPad, why don’t I use iTunes’ Home Sharing instead? Besides, my music repertoire is already in iTunes. The only worry I have is the output quality through the headphone jack to a pair of RCA plugs to my AV receiver, I test it and it sounds decent! 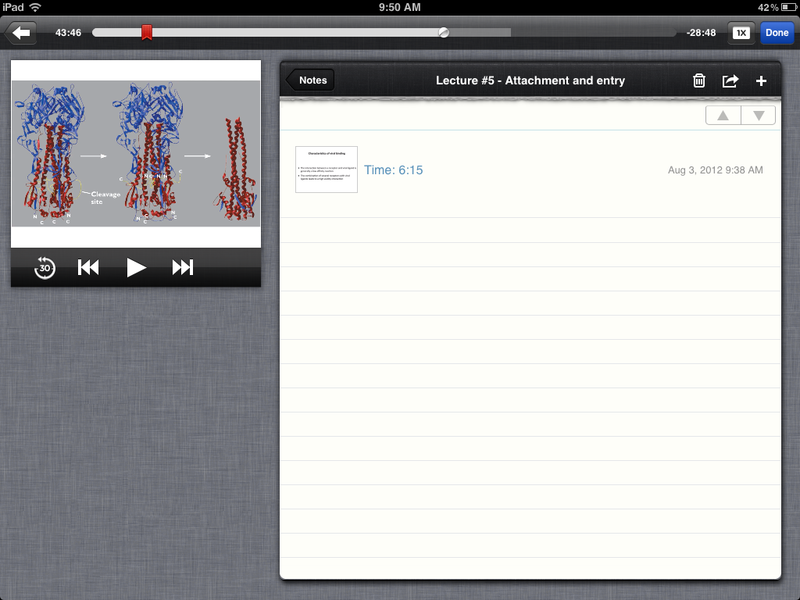 So what is nice about using iPad as my media center instead? Well, everything is now touch base! and the library recognition is painless and seamless. What you see in iTunes is what I get on my iPad, and ‘Music’ app is easy to use and to find and pick songs. I can also stream videos with Home Sharing. On iPad, iPod Touch, and iPhone under music>settings>turn-on Home Sharing, and ‘Music’ app, under ‘more’ >sharing>select your music and video library. This means I get the same libraries on my iPhone too, an additional tool to play my music and videos at home. With the PS3 system, it will recognize Windows Medias automatically if you turn your sharing on in the PC. That’s another option to stream your medias at home. I guess that’s the same for the Xbox 360. Now I don’t have a Window Surface, so I don’t know if the touch-base experience will be the same?! With an Android tablet, I believe Boxee is perhaps a good option, it works with iPad too. There you have it, I figure it will be cool to use this setup for your Christmas Party! Sure, you can download music to your iPad and plug it to one of those extended speakers, but with my way you have access to thousands of songs !!! and additional audio settings with your AV receiver. I have an iPad 2 with 16GB. As we all know with the iOS installed, we only left with 13.4GB for all our stuff. Mine has been at the critical point of 1GB lately, so I started deleting stuff on the iPad to reclaim some of the space. I only have apps on it now, I stream my music from my iTunes library, and not really crazy to have movies and watch them on my iPad. It has been 3 years since I bought it, I figured last week it was time to reset it to factory settings and restore my backup to give it a deep cleaning, like how we are supposed to with our laptop every year to cure performance issues. So I did it last week. Make sure you backup your iPad on the computer before doing anything!!!! It took about an hour, and you know what, now I have 9.4GB of empty space, that’s almost 900% gain.I was astonished. I think when you deleted apps on the iPad, it didn’t really uninstall the entire app, so some stuff were left behind…so this is the only way to clean it up, get space back, and improve performance: it had been freezing many times before I did this. 2) select device and pick iPad. On summary page, Backup and then Reset to Factory Settings. Everything will be exactly before the reset including your wallpaper! I am going to do same with my iPhone now. 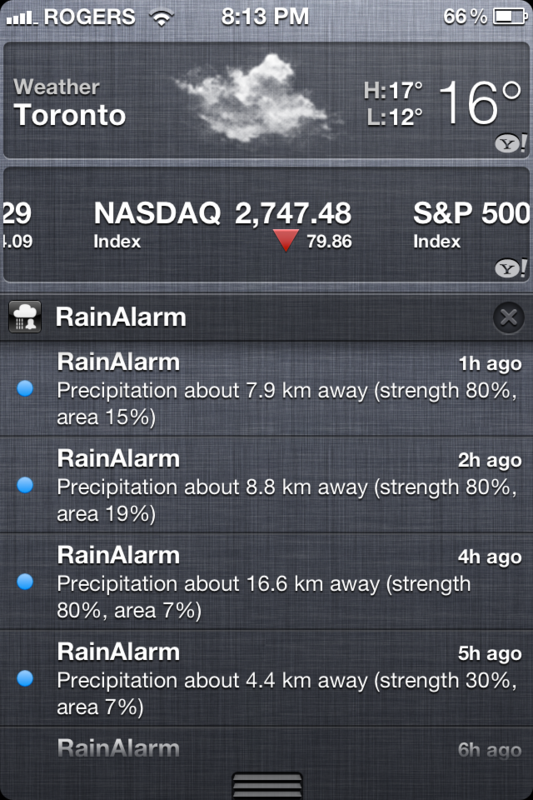 Weather … we love to talk about! Weather is one thing we talk about socially, so with iPhone it is handy to have WeatherEye app, which other than shows the short and long-term forecasts, it also shows the hourly temperature predictions. 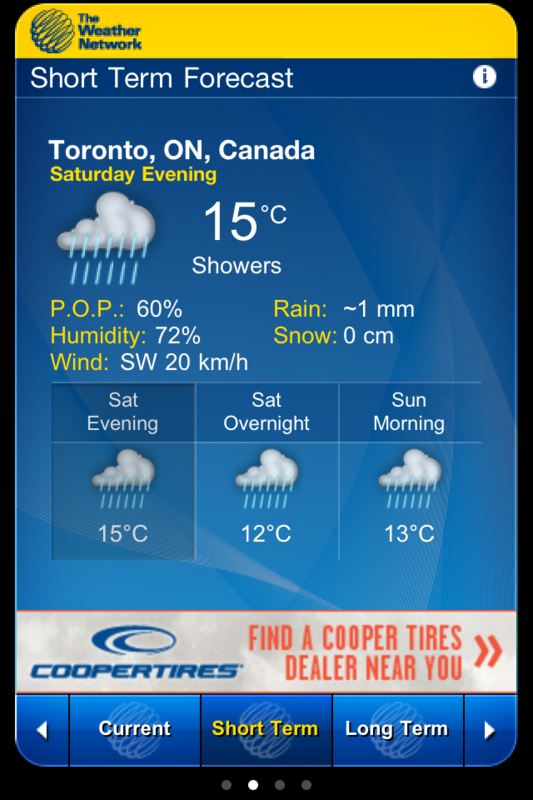 I know this is trivia, but interesting to find that out, cause I do prefer the Weather layout more. The other thing you may know is that notifications will give you weather forecasts as well: drag and slide the top bar on any page that shows your provider/clock/battery. 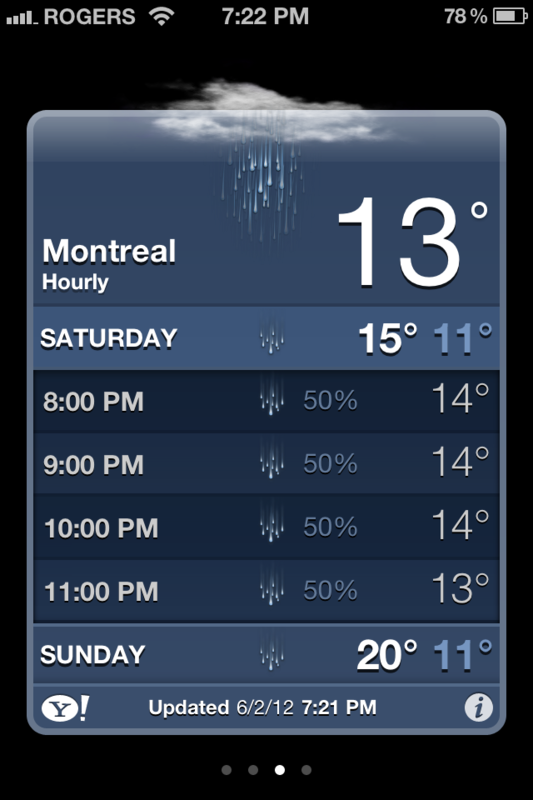 Swipe the weather bar will give you the current condition, and vice-versa. 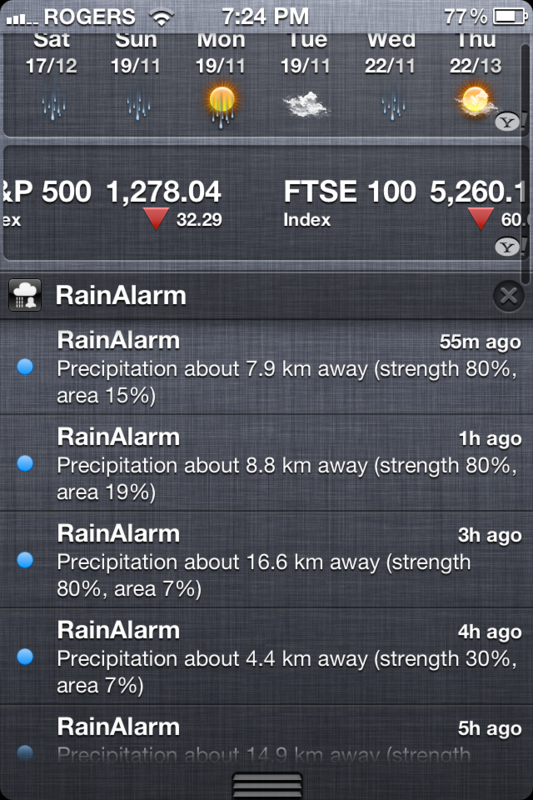 Rain Alarm is another app that I like that shows precipitation forecasts. If you are a student and has a 8:30 am class, I know that “10 more minutes” feeling. However, since you need those credits to graduate, you better haul your behind and get ready! So iTunesU is not a new thing, it used to hide behind Podcasts, and you can access full audio or video lectures by first selecting the course you want to listen or watch. These are not some obscure University’s lectures we talk about, they are from Oxford, Havard, Princeton, UCLA, the Ivy Leagues. Beside from saving a lot of money to attend one of these lectures, some of the professors are well known. When in the old format tugged under iTunes Podcasts, I even indulged watching a few video lectures in French from HEC-Paris! Now, for me it is better than watching a free full-length pop-star world-tour. – Each course you subscribe to or download will have its own binder cover sitting on the bookshelf (consistent theme with iBooks, Newsstand). In comparison, in the past it was just an icon with list of clips available to download like iTunes music or podcasts. – Each binder when open will have four folios: Info,Posts, Notes, Materials. Before, you might have some pdfs, or ppts that needed to be downloaded separately. – With Notes, you can take notes, of course, but now they are all in the same binder. I used to do it either with OneNote or just a txt document and as such all over the place in my laptop, iPad, etc. Once again, this will appeal more to “the new 40’s, 50’s, 60’s” people in the crowd, who love to learn, but cannot afford physically(time), psychologically (sitting with 20’s something in a classroom), nor financially to go back to University. The best part, there is no limit of what we can learn: Quantum psychics to developing iPhone apps. See, Bill Gates may donate millions to promote education; Apple, and the late Mr. Steve Jobs, gives people the tools to access free education, and that’s the difference!! Learning, after-all, is from within, and iPad is the right tool! P.S. I teach accounting, and I just carry my iPad for my lecture notes, instead of stack of loose papers in a folder that I used to. Smartphones: an evolution not innovation! Smartphone is not an innovation, but a convergence of technologies: cellular phone, personal digital assistant (PDA), a portable game console, a digital camera and recorder, and a eReader. In other words, each of these technologies exists on its own, and still has its own niche market. Nonetheless, it is a good thing cause it saves a lot of space in lieu of carrying all these stuff. What happened in the past, some of the stuff, like my pocket digital camera was just left at home… same went for my Palm III and later Toshiba E400 (colour- 256K) PDA. Simply, it was totally inconvenient to carry three or four gadgets with me. Now, all I have is my iPhone 4. I have been telling my friends that there is really one thing that distinguish it from an Android phone: its elegance. 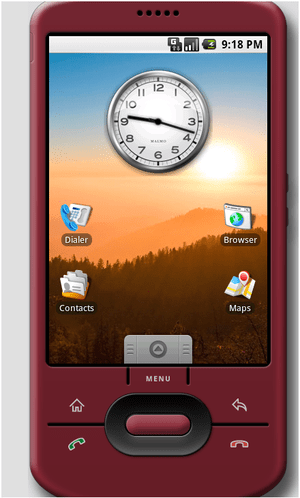 I can say that because before I converted I was using the first generation Google Phone: HTC Dream. Three years ago, it was a great phone and so much less expensive than the iPhone, and it had so much potential. what turned me off was the fact that Google didn’t care about hardware side of thing, i.e., no support for hardware. In other words, the cell phone manufacturers were responsible for its products’ BIOS updates and Android OS updates. First, if the manufacturer had no plan to provide that, there was no way to update the phone. Second, even if it was provided, it was hell to update an Android phone without knowing much about firmware, flash BIOS, data back-up, and more importantly whether a newer version of the Android OS was compatible with the hardware (Last check, I think this is still the case with any Android phone. Honestly, I have no idea which version is the latest OS, and which phone comes with which version of the OS: buyer beware!) 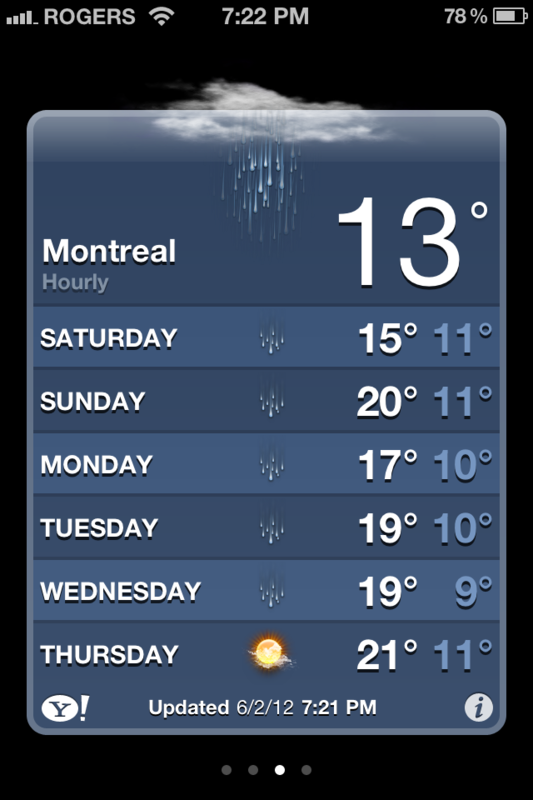 Now, you understand why I switch to the iPhone. 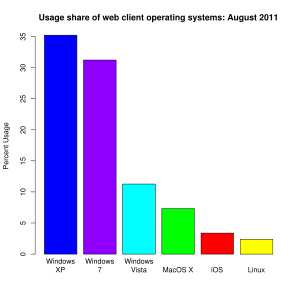 True, it’s a closed system, but for average users, knowing less isn’t better than knowing more? For we just want to use the phone! Why iPhone? everything is smooth and easy, and no tinkering under the hood. I turned it on, within second I know how to use it (perhaps because I had a iPod Touch before?!). The icons are intuitive, fast to the touch, apps open without delay, no freeze, quick re-boot… the list goes on. Yes, before iOS5, you have to plug it into your computer and sync with iTunes, but it might not be a bad thing, cause it forced you to back up your data. That’s not the case with an Android phone, you don’t backup, you lose!… everything, if you have to restore to default. Final words: test drive the smart-phones before you settle on your favourite!